It has been said time and time again, but meal planning really is the one of the best ways to save both time and money at the grocery store (here’s a great free printable meal planning kit). Of course this tip comes at the expense of spending a good amount of extra time at home planning out the meals and grocery list at least a week at a time. However, when done well, meal planning saves some serious cash by giving every single item on your list a specific purpose. It also helps you find places to trim or double up on certain items and you are creating your plan and even includes planning for leftovers. While your meal plan can help save you money, a well-organized grocery list can help save you time at the store. I’ve tried paper lists, grocery list apps, and everything else under the sun and they can all work. But the list only makes your shopping faster IF you follow one important rule… organize your list by department. That means instead of writing your list in whichever order you think of adding them (ie: eggs, avocado, chicken, bananas) causing you to run back and forth across the store, your list should have like items together so you can work your way through your list and the store at the same time. Bonus points if you set up your list to follow the floor plan of your actual store. Before you head to the store, make sure to shop your pantry, refrigerator, and freezer first. In fact, this should probably come before tip #1 because if you really want to up your game, you can plan your meals based on the items you already have at home! By using what you already have, you are not only saving money by not buying more groceries, but also saving the time it would take to think about whether or not you have a certain item in your pantry already. Once you finally get to the grocery store, make sure to use technology to your benefit. Because… there’s an app for that! Remember the list you made? There’s an app for that too! My favorite is Our Groceries because my husband can add items from his phone and it will instantly appear on my list. Also, it’s automatically organized by store department and you can edit the department if you need to. I haven’t tried every app out there, but I’m sure there are plenty of others that would serve this purpose just as well. There are also apps for helping save you money at the store, from Walmart’s Savings Catcher to the Target Red Card (and Cartwheel) you can always save money if you take a few minutes to check out the deals before heading into the store. I’ve saved my very favorite tip for last because it compliments every other tip from this list AND makes my life exponentially better. Ordering groceries online is the one-two punch you might not have expected to see on this list… right? There is a stigma that ordering groceries for pickup or delivery is a luxury and very expensive. In truth, ordering groceries online can be a great way to save money (and obviously time) on groceries. While there is often a slight markup on some product and/or a delivery fee, those extra costs are often offset by the other benefits of buying groceries online. No more worrying about shopping while hungry. No more making unhealthy or unnecessary impulse purchases. No more going back to return an item you’ve decided might not fit the budget or meal plan for the week. All of the grocery delivery services I’ve tried not only let me see the running total as I add items to the cart but they always have sale sections that are very easy to find and plan meals around. I shouldn’t even need to mention how much time you can save by not stepping foot in the grocery store, but ordering groceries online allows you to fit groceries into your schedule when you can’t manage a full trip to the store. Bottom line, grocery shopping has to be done… but if you can do it faster and within your budget maybe it won’t be such a source of pain! 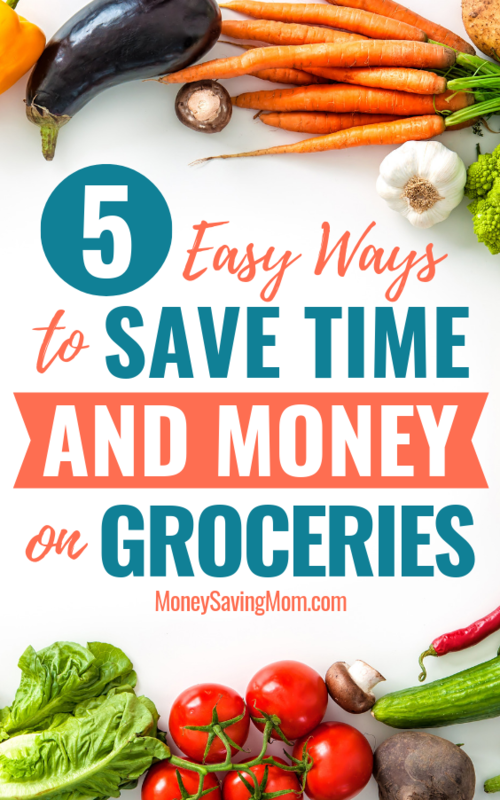 What are YOUR best tips to save time AND money on groceries? Jenna is a mom to four awesomely exhausting children. She believes that finding the right food for your family should be easier. That’s why she is committed to providing information you need to make deliberate choices for your family over at Particular Pantry. « Gymboree: Extra 50% off Entire Site + Free Shipping! I am shaking things up this month with my grocery shopping. Your last tip is what hit me. I have used grocery delivery and pick-up services in the past, but it wasn’t something that fit into my budget. I love Safeway’s delivery service because they deliver your groceries by putting them ON YOUR COUNTER. That is huge! My only job is to sit down and order things, which gets easier every time, and put the groceries away. Yippee! Grocery shopping is exhausting for me. The downside is that the weekly sales offers are not available online, which is how I save a lot of money at Safeway. In addition to not being able to access the sales, the food is also marked up. A $3.99 package of bottled water might be $6.99, for instance. I avoided the delivery fee of about $13 by requesting a large delivery window, having a large enough total or ordering specials (usually baby items). I ended up shopping inside my local store instead of using delivery, unless I was crunched for time. I have tried the Kroger pick up and thought it was worth their fee, which was about $5. This month, however, I am trying WalMart. I don’t think I did a particularly good job of it, but I ordered all my groceries for the week through WalMart. I pick some up today at a nearby store, some are being delivered with free 2-day shipping (regular walmart.com) and I will pick some up tomorrow after I go to the gym (groceries.walmart.com.) I am learning how to do this. In the future I hope to figure this out and have a good system that works for me. I think it will be worth the effort. Thanks for the article! I appreciate the encouragement. It definitely takes a little time to figure out how to use grocery delivery or pickup while still staying on a budget but it is worth it in the end. That Safeway delivery fee is crazy and there are much more affordable options as you’ve already seen. If you haven’t already you should download the Walmart Grocery app, it is really easy to use and order for pickup. I use it weekly! Follow-up comment: I really liked the WalMart pick-up! It is a great service and I appreciate WalMart’s low prices and delivery fee. The employee was very helpful and quick. I have a couple of questions. How do I use coupons? Does the app still submit my receipt for the grocery price scan? I didn’t try scanning my receipt for Ibotta but I assume that is still fine. The downside was that having the hour pick-up window reserved was stressful. My daughter ended up being sick and we didn’t go to the gym, which is right across the street. This is the third closest WalMart, so it is not exactly close. The closest one does not carry groceries. The next closest had a different order minimum, which I didn’t meet. I think I will try this every week for the month of January and see if I can get into a rhythm. If not, I will switch to Kroger, which is not far. Thank you for this info! I will check out your blog to learn more. I’ve found that Walmart doesn’t really care if you’re late picking up. They just might message you like 5 hrs later and ask if you still want the order. That might make it less stressful for you! I’ve always been really happy with the service from Walmart pickup and I love that there is no stress (or added cost) of tipping. Unfortunately, Walmart doesn’t let you use the Savings Catcher with your pickup orders and I don’t think Ibotta works with it yet either unless you go in and have your receipt printed in the store. If you don’t find it works for you to go to the farther store, I’ve heard amazing things about Kroger’s service too. Would love to try ordering online but unfortunately in my area I am unable to use “food stamps” as payment. Due to a disability, these are a unfortunate necessity of life. I do, however, use coupons and several apps such as Ibotta, Saving Star, etc which help greatly in helping me get a healthy and affordable supply of groceries!!! I’m sorry to hear you are dealing with a disability Teri. The good news is there are a few online grocery options that are starting to accept EBT, Walmart, Amazon Prime Fresh, Amazon Prime Pantry and Schwans are what I’ve seen. You can find more info about it at https://foodstamps.org/Articles/Article/ID/172/use-your-ebt-to-shop-for-groceries-online. Also, Imperfect Produce doesn’t accept EBT (yet) but they offer a reduced cost box to anyone that qualifies. They have already awesome prices on “ugly” produce but are only available in select areas so they aren’t an option for everyone yet. I love the Kroger app! You can add items to your cart-not the list, I don’t know why that’s even part of the app—and the app sorts them and includes the aisle to find them! It makes my shopping sooooo quick and easy. And I can make my cart using their sales ad, and decide if I want to clicklist it or go shop myself. That is awesome! I don’t have Kroger by me but I’ve only heard great things. I love that they have a list app and that you can use their sales ad. Kroger app for the win! Great idea for older folks/or disabled people as well who have difficulty getting out of their house. A whole new way for people to be independent. Are there gift cards for people to use when ordering? Just a thought! Absolutely! I also think it is a great baby shower or new mom gift. Great idea for elderly/disabled who have difficulty getting out as well. If there were gift cards for giving, I’m sure those would be greatly enjoyed and appreciated as well. I have been using Walmart’s grocery pick up for about a year and love it! It’s free and I don’t have to spend an hour or two pushing a heavy cart around! I will say a time or two they made a mistake but it wasn’t anything huge. I noted it in the survey and someone called me the next day and made it right. It works out so well that I can do my order the day before and easily see the prices (no mark ups!) and my order total. Very user friendly and encourage everyone to try it if it is available in your area. Me too Dawn! I use it weekly and have only had one or two errors ever and as you said they make it right as soon as they hear about it. My kids also love when we get a special goodie bag for certain seasonal things like Mother’s Day or Back to School. I love using Walmart pick up! I add things to my cart through the app all week as we run out or remember something we need. I appreciate that I’m able to see the cost all along and budget accordingly. It has been really helpful this month since I am trying to stick to $40 a week while I do a pantry/freezer challenge to clear things out. There is no fee or grocery upcharge for this service! That is exactly what I do Amy. No need for a separate list, I just add things as I go and when I get over the $30 minimum I do a quick check of my fridge and pantry, add a few more things and reserve my pickup time. I love the idea of a pantry/freezer challenge. I really need to do that! I will be trying out ordering online especially when I’m sick and the hubby has to grocery shop. He comes home without items on my list and added extra items of his choice. Online ordering will be so helpful to avoid this! It will be a time saver too. I plan to try this out with Sams Club, Walmart, and Hannaford. Unfortunately, I do most of my shopping at Market Basket that doesn’t off this yet! Thanks for the idea! Great point! Grocery pickup is my go-to when I am sick or home with sick kids. I don’t have a Market Basket near me but is there any chance they offer delivery through a third party delivery service like Shipt, Instacart, or Peapod?